Autonomous vehicles are getting smarter. The self-driving car revolution continues apace, but until now autonomous vehicles needed to have a flesh-and-blood, human driver as back up if they were allowed out in the road. Not any longer. Over in California, where a lot of these software-controlled cars are currently being put through their paces, authorities have given the all clear for them to set off without anyone in the car to take control if something goes wrong. The new legislation only applies at a couple of testing sites in the state, so self-driving cars can't go solo on real roads just yet, but nevertheless it's a landmark moment for a technology that has advanced rapidly in recent years. Google has made no secret of the fact that it wants to ditch manual controls completely, in the end, because we humans are just too unreliable and untrustworthy to even act as backups when it comes to motoring. 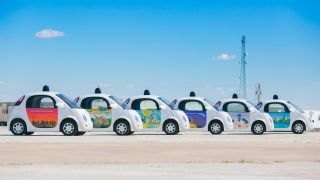 Now Google and other companies will be able to test their tech at Bishop Ranch business park and Concord Naval Weapons Station, an empty town where several firms are running trials of autonomous vehicles. Cars without people inside must not exceed 35 mph for the time being, the new bill says. Steering wheels, brake pedals and accelerators for manual control will not be required, as they are now, so car makers can go one step further towards our driverless future. Still no word on whether Apple is about to throw its hat into the ring, though.